HMD Global announces the Nokia promos for the month of March. Discounts and free speakers await lucky buyers. 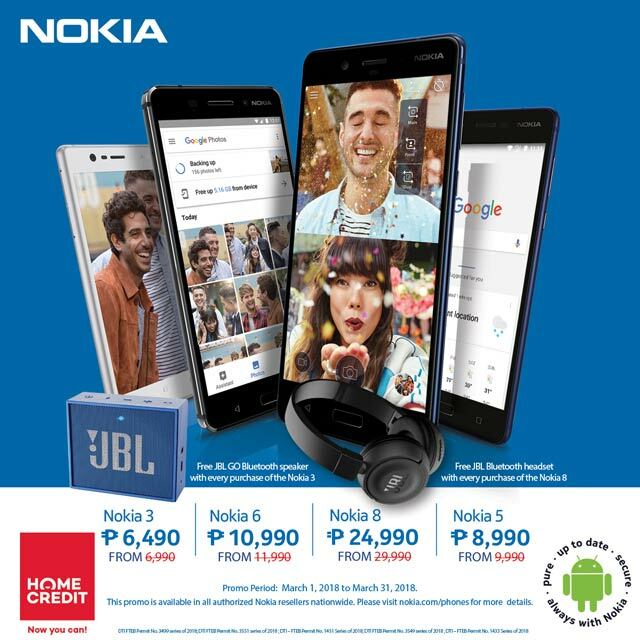 HMD Global announces their Nokia promos for the month of March. Buyers of select handsets will get discounts and/or free accessories. From March 1 to 31, buyers of Nokia 5 and Nokia 6 gets Php1,000 discount off the regular price. While buyers of the Nokia 3 will get Php500 off plus a free JBL GO Bluetooth speaker worth Php1,599. 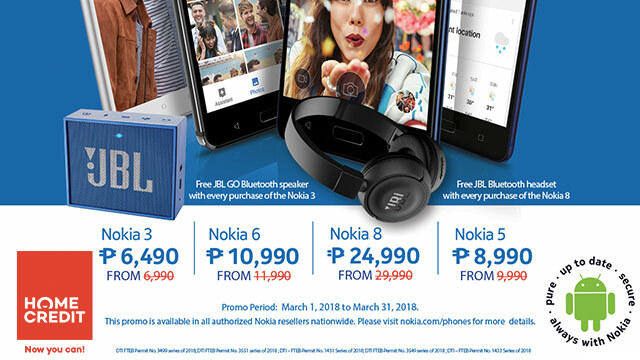 Buyers of Nokia 8, on the other hand, will get Php5,000 discount and a free JBL Bluetooth Headset worth Php3,000. Now priced at Php24,990, the Nokia 8 features a 5.3-inch quad HD IPS display. It is powered by an octa-core Qualcomm Snapdragon 835 processor, paired with 4GB of RAM and 64 GB of storage. The handset boasts of a dual Zeiss 13MP + 13MP rear camera, and a 13MP front camera. It runs on stock Android. The Nokia 6, which retails with a promo price of Php10,990, features an aluminum unibody build, a 5.5-inch display, a Qualcomm Snapdragon 430 processor, 3GB RAM and 32GB storage. The phone has 16MP main camera and 8MP for selfies. It has a 4G support, NFC, a fingerprint sensor, Dolby Atmos, and Android 7.0 out of the box. The Nokia 5, promo price of Php8,990, features a 5.2-inch HD display, a Qualcomm Snapdragon 430 processor, 2GB of RAM and a 13MP main camera. The phone also comes in a metal body. Storage capacity is set at 16GB, with expansion up to 128GB. It has a fingerprint sensor at the back for added security and a 3,000 mAh battery. With a promo price of Php6,490, the Nokia 3 features a 5-inch display with Corning Gorilla Glass protection, and an aluminum frame. It is powered by 1.3 GHz quad-core MediaTek 6737 processor coupled with 2GB of RAM and 16GB of storage. The phone packs 8MP front and back sensors, both with f2.0 apertures, autofocus, and 1.12um pixel sizes. Nokia also extended its partnership with Home Credit. Buyers can avail 0% interest installment for 12 months for the Nokia 8, and 6 months for the Nokia 2, Nokia 3, Nokia 5, and Nokia 6. The promo is now available in all participating outlets and dealers nationwide.